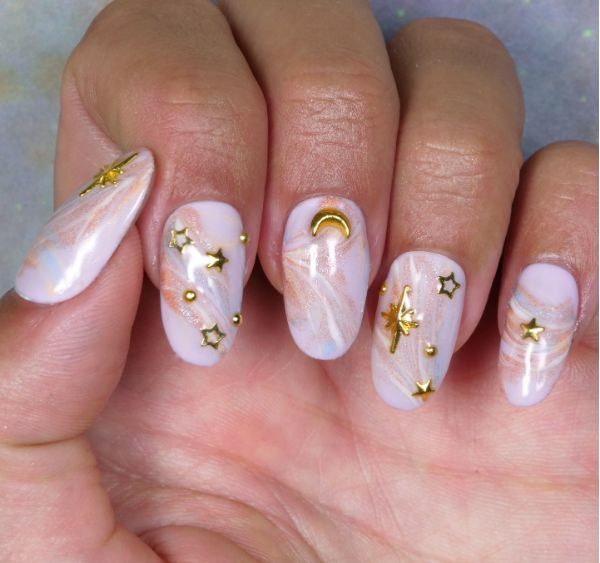 With winter weather in full swing, nail art professionals turn to the heavens for inspiration. Celestial elements like moons and stars make a great addition to a pastel infusion of colors. This pretty design captures those hues and marries them with a 3D gold nail decoration. Painting this design doesn't require a steady hand. The swirls of color bend every way, and no two designs are exactly the same — nor do they need to be. To get started, watch the video. 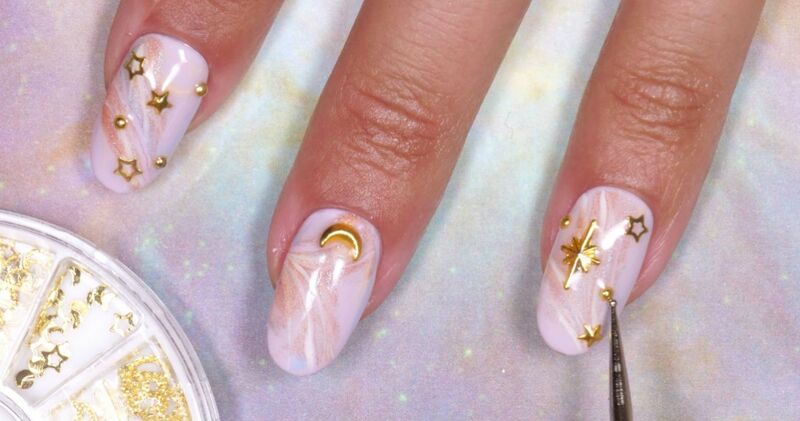 Different shaped nail brushes are used to create thick and thin-shaped swirls, which make the final design appear as though the moon and stars are floating on a sea of color. 1. Apply two coats of lavender gel nail polish to the nails and cure with the UV or LED lamp (step not shown). 2. Apply a single layer of clear gel base coat to the nails and cure. 3. Paint swirls of color on each nail from cuticle to nail tip with blue, peach, and white nail paint and the angled nail brush. Cure with the lamp. 4. Apply a coat of peach nail polish over the swirls. Add more colored swirls as needed with the fine-tipped nail art brush, and then cure. Tip: Don’t cover the entire nail. The swirl pattern should be predominantly in the center. 5. Apply a thin layer of clear gel base coat, but don't cure it. Using the nail tweezers, place the gold nail art shapes into the wet gel, then cure. 6. Top with a layer of gel top coat and cure one last time.